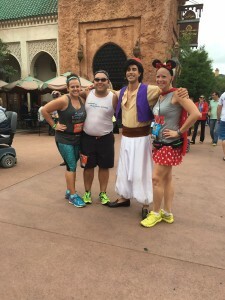 Great friends and one street rat enjoying a victory lap around Epcot’s World Showcase in the final mile of the 2016 WDW Marathon. Now it was time to make my way on to Osceola Parkway for a longer (minor hills) stretch. As I came upon mile 14 I realized that I needed to change my intervals if I wanted to have enough gas in the tank to finish this race. So for the next two and a half miles I played with my intervals: 45 second walk: 1 minute 15 second run, 30 second walk: 45 second run & 45 second walk: 45 second run. Right after mile 15 Laura and Jason were there to cheer me on (I loved the course support and want to make sure everyone knows how much I appreciated them being out there!). Around mile 16 I found Helene and Mike again for another game of cat and mouse. Right before mile 17 it was time to turn right into the ESPN Wide World of Sports, which was mentally hard to do because to the left you could see people already heading toward Hollywood Studios. I knew the Wide World of Sports section was going to be tough because it was my least favorite part of the course last year. Another mental issue with going into the sports complex is when you’re going in the people on the other side of the road are people crossing the 20 mile marker, so you know you are going to be in there for three miles. Upon entering the complex we were given sponges to help cool us down this year. I was just ecstatic to have something to wipe all of the sweat off of my face. At this point I was in desperate need for a bathroom, which in turn separated me once again from my running pals. I stopped right before mile 18 to use the bathroom, then I was ready to start going again. After I crossed the mile 18 marker I was elated, why you ask? Last year, mile 18 is when I hit my wall. I was over the race by this point last year and was ready to quit, but I kept telling myself if I quit I would have to run again next year to prove that I could finish (funny, I ended up running again anyway). That thought is what kept me going to finish the race though and I would walk the remaining eight miles. So the fact that I still felt like running at mile 18 this year was the greatest feeling ever. At this point I was pretty much staying with a 45 second walk: 45 second run. I think because I was so happy with my accomplishment at mile 18 it was able to stay with me till I got outside of the sports complex and hit that mile 20 marker. At mile 20 I was feeling a little rough and realized it was time for longer walk intervals. My watch began to beep low battery at this point too. As we say: Accept. Adjust. Advance. I decided to take out my phone and turn on my RunKeeper app in case my watch died I had some sort of idea for intervals. I also realized at this point from runner tracking that Mike and Helene were about three minutes ahead of me and I probably would not catch up with them. That was okay though because I had another breakthrough at mile 20: there were still runners coming into ESPN, which was not the case for me last year (I was one of the last to enter in 2015). So, with a renewed bounce in my step at my personal improvement, off I went on my way to Hollywood Studios, keeping about a minute walk: 45 second run. Upon returning onto Osceola Parkway I got excited once again because at this point last year the infamous balloon ladies were within my line of vision, but this year they were on the other side of the road still having to turn into the Wide World of Sports complex. Around mile 22 the race really started to get tough for me. At this point my GPS watch died and I knew I was no longer keeping a decent run/walk interval. Once I made the turn to go to Hollywood Studios I was ready to begin walking. I pulled my phone out and began texting Jill, my inspiration from the Half Marathon the day before. She kept me going for the next two miles! 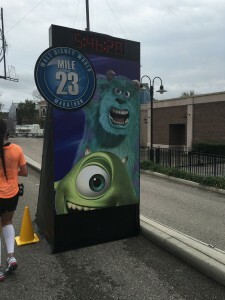 Those miles were rough and even though I was going through Hollywood Studios and the Boardwalk resort area. Even though there were a lot of great spectators, I did not get the overwhelming feeling of needing to run in front of them. It took every ounce of discipline I had to make myself stick to an interval running plan (using light posts, signs, or whatever as my interval markers). Bonjour! Bonjour! …Marie, the baguettes! After mile 24 I received a text from Helene saying she and Mike were waiting for me in Epcot at mile 25! I knew I could give all I had left in me to run the next half a mile to meet up with them and finish the race with my friends. 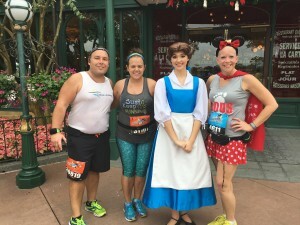 I made the turn into Epcot’s World Showcase and started running as fast as I could to the mile marker, and there they were ready to casually enjoy the rest of the course with drinks in hand! We spent our time enjoying the race (and our adult beverages!) for the next mile. There may have been a few character photo stops and encouraging cheers from spectators and Disney Cast Members who were amused that we were finishing a marathon with tasty beverages in hand. Unexpected Magic. Leaving Epcot we randomly ran into a couple other friends, John and Lauren, and the five of us were able to finish the race together with Jill, Laura, and Jason cheering us on at the finish line. There is no way that we could have planned this, it just happened, and I can not envision a better way to finish this race. I ran hand in hand with Mike past Mickey and across the finish line. It was an amazing finish to the race, complete with a PR! There’s something to be said when someone puts a finisher medal around your neck. Getting the marathon medal placed around my neck that day felt like the greatest accomplishment in the world. I worked so hard to have a better race than the previous year and I was able to do so! The marathon medal was gold with a giant Mickey shaped head on it with a running Mickey inside of it. In my opinion, much better than last year’s SMO. 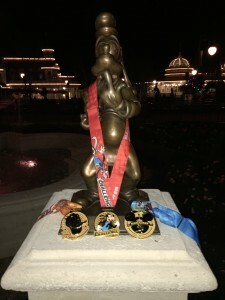 The 2016 Donald Duck Half Marathon, Goofy Challenge, and Mickey Mouse Walt Disney World Marathon medals. After making our way through the finish line hoopla we had to go thru the tent for Goofy runners. There they verified our bib with the picture we took at the expo to prove it was us and to also prove that we had ran the half the day before. After meeting that criteria, the Goofy medal was placed around my neck. 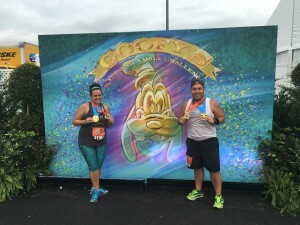 The Goofy medal this year has a colorized painted Goofy on the medal. Not my favorite challenge medal, but definitely not my least either. Overall I was very happy with the three SMOs I had received EARNED over the two days. I regretted not getting the marathon weekend jacket at the expo earlier in the week. I was very excited after the full that in the merchandise tent they still had a few leftover and I was able to buy one of the last ones! After that Mike and I made our way to the resort bus where we enjoyed our runDisney snack pack on the drive back to the hotel. Then it was time for showers and naps! This is the point where I realized how injured I had become on the course. Remember back to earlier when I was talking about the sports bra I wear for every race?… well, upon getting in the shower and the water hitting my skin I realized I was chaffed all the way around my bra line, including severely in some areas. Now I know what you are thinking, I should’ve worn body glide… I did. I think because it was so humid out I was dumping water on myself to cool off and it made the body glide wash off and thus chaffing! I definitely need to figure out how to make this better for next year (yes I said next year). Our readers do keep telling us that we are a little bit Goofy, now we proved them right! The only thing I have to add as far as my playlist goes is that this year I decided to add entire musicals to my playlist to change things up and I ended up absolutely loving this. It’s a nice change to get to hear a story for an hour of your run. Then in between musicals I had my mix of Disney classic and Top 40 songs. Will I run this again? Absolutely!!! Were these my thoughts at mile 23? It may have been touch and go there for a few miles (haha). Were these my thoughts at the finish line? Absolutely! I was all about only running the marathon again next year until three days later when we realized a half marathon anniversary medal will be next year so Goofy was already an automatic thought, but now I am really starting to contemplate Dopey again. I may be pretty Dopey after all, but all my friends are too!!! If you have no idea what happened to the first half of the race, then you obviously forgot to read Part 1! So go back and check it out now. You can also watch our Course & Race Highlight Video and click on the links to all of our other coverage of this great event is at the top of the page!